With the best of intentions, a Christian congregation throws its energy and resources into obeying Jesus' command to be salt and light in society. Its members feed the hungry, care for the sick, and strive for social reform. They have scholars and teachers of the highest caliber and even publish their own literature for the wider community. Their spiritual reputation and social connections have earned them the ear of the leaders of the land and a foot in the door of powerful government offices. They are eager to serve the world, but the world bites them back. Their activities become more and more shaped by society's agendas. Their leader is hardly more than a political pawn, his eyes set more on money and prestige than on spiritual matters. Are they transforming the culture, or is the culture transforming them? Have they gained the world only to lose their souls? The situation sounds remarkably contemporary, but this tension has recurred throughout history—and it was the tension faced by Benedictine monasteries in the early Middle Ages. The original monastic impulse was to be countercultural, to separate from the distractions of the world in order to be single-mindedly devoted to God. Under the emperor Charlemagne and his successors, however, the monasteries were thrust into the center of cultural influence—leading to remarkable accomplishments that forever changed Western Europe, and also to challenges that tested the soul of monasticism. When Charlemagne took the reins, Europe was teetering under regional warfare, poverty, illiteracy, clerical corruption, lax spiritual standards, and lingering pagan practices. There were no major cities. Local life was agrarian and feudal. Education had become nonexistent. Thus, one of his chief aims was to bring order and reform to both society and the church. Charlemagne read his Bible regularly and regarded himself as the protector of the church. Monasteries played a vital role in his vision for a Christian civilization. He urged the monks not only to have a strong spiritual commitment but also an active cultural life. Many Christian leaders shared Charlemagne's desire to strengthen the monasteries. One of them was Benedict of Aniane, who eventually became an advisor to Charlemagne's son Louis the Pious. He is called “the second St. Benedict” because he zealously promoted Benedict's Rule as the best means to purify and unify the scattered, undisciplined monasteries. Benedict of Aniane wanted monks to devote themselves to prayer and to strict observance of the Rule—though not to the exclusion of their social role in the community. The purpose of monastic life should not be just to escape from the fires of hell, but to serve and to teach. Monks were at the heart of this explosion. They heeded Charlemagne's warning that “correct conduct may be better than knowledge, nevertheless knowledge precedes conduct,” and mastered Latin in order to study Scripture and other early documents of the church. Monasteries became publishing houses, producing original manuscripts (such as the monk Einhard's biography of Charlemagne) as well as tens of thousands of copies of biblical and classical texts. The monk-copyists developed a clear style of handwriting known as Carolingian minuscule—readily recognizable as the ancestor of basic letter shapes today. Monastic libraries often held several hundred titles (the largest, at Fulda, had almost 1,000), including Bibles, church fathers such as Augustine and Jerome, saints' lives, and major classical writers such as Cicero, Livy, and Tacitus. The monks' tireless efforts proved essential for the preservation of ancient literature. In most cases, the oldest surviving copies of such works we possess today were made by Benedictine monks in the early Middle Ages. If there were books to read, there had to be schools to teach reading. Monastic schools were the most successful of the era, imparting the liberal arts to boys and girls destined for church careers or convent life. Many monasteries grew large and wealthy because they were endowed by kings and nobles to pray masses for dead relatives, to serve as royal way stations, or to provide educational services. The number of monks in a monastery could range from a handful to hundreds—on rare occasions more than a thousand. The peasants who lived in the monastery's orbit—doing manual labor for the monks or tilling the fields, for example—often numbered several thousand. The largest of these monasteries, St. Germain–des-Pres, owned 124,000 acres of land with a population of at least 12,000. Such monasteries were important commercial and industrial centers, possessing fleets, wharves, rights of coinage, and the privilege to hold markets and fairs. They were the big businesses (local and international) of their day. After Vikings destroyed their wooden buildings, monasteries began building stone structures, often with towers and multiple churches. Some served as parish churches for the surrounding population. In addition to being local centers of religious life, economic and agricultural activity, and education, monasteries served as welfare agencies, medical caregivers, and even travel accommodations. Their crafts and agricultural products benefited society; their stability strengthened society; their prayers interceded for society. But these things were peripheral to the central spiritual purposes to which Benedict of Nursia had called his monks in the sixth century, and which leaders like Benedict of Aniane continued to call monks back to in the ninth century. The revitalization of monasticism left an indelible mark on Christianity in Western Europe, but there was a dark underside to this cultural influence. The rulers of Charlemagne's dynasty believed that a king's rights included control of the church and its possessions. Individual monasteries were very often under the authority of the king or wealthy landowners —a privilege abused by those who exploited the monasteries' economic resources for their own benefit. A monastery that depended heavily on the king's gifts of money and prestige had little freedom to go against the king's will. Charlemagne often appointed his allies to be abbots, who frequently served as royal advisors and agents. Some of these abbots put personal and institutional aggrandizement above their spiritual callings. The monasteries were in grave danger of becoming political tools of the civil authority. The new social roles tended to make the essential religious functions of a monastery incidental. Monastic reformers worried that the communities were straying far from their original ideal—undistracted prayer and worship. Wave after wave of Viking invasions from the early ninth through the tenth century did not help matters. The monasteries' great wealth and land holdings made them prime targets. Vikings ravaged the monastery of St. Martin of Tours on the Loire River in 853, killing 100 to 200 monks as well as other inhabitants of the region. Over 200 of Western Europe's 700 monasteries were destroyed, and many others were damaged. Ironically, the invasions that forced many monks out of their homes drove them eastward, spreading the accomplishments of Benedictine monasticism further. The trials by fire faced by the monasteries seem to have been a refining process. Such challenges directed the monks back to the life of the spirit and paved the way for spiritual renewal in the 10th and 11th centuries. The tension between separation from the world and service to the world would be a continual struggle. But the strength of monasteries in Charlemagne's empire—a rope that held tight even when the empire fell apart—had an immense impact on the recovery, preservation, and enrichment of European culture. Thomas O. Kay is associate professor emeritus of history at Wheaton College. 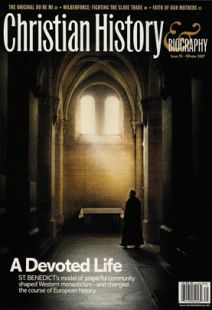 Jennifer Trafton is managing editor of Christian History & Biography. Julie Andrews made it popular, but the real musical genius behind this singing aid was a medieval monk.